Who doesn't love cookies? I know I for one could live on them. I love all kinds of cookies, cake-like, soft and chewy, and for sure- crisp and crunchy. In other words, biscotti. 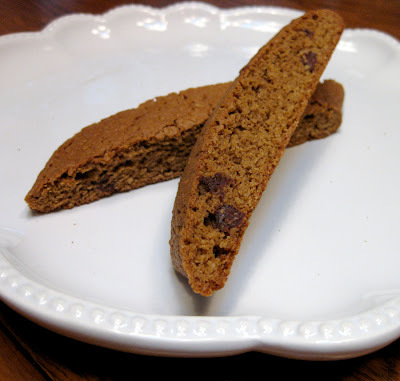 The word biscotti means twice baked in Italian. I learned that word a long time ago when I was a kid from my Italian mama. 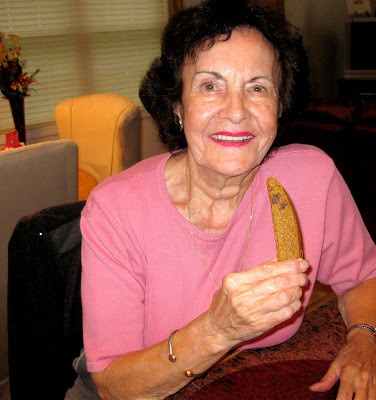 My mom loves to bake, but doesn't usually make biscotti. She likes to make bars mostly. But she is a big fan of MY biscotti and can't wait to try any new batch that I dream up. She really enjoyed this last recipe. I asked her what she thought of them and she said "DELIZIOSO!" Preheat oven to 350º. Line a cookie sheet with parchment paper or foil sprayed with cooking spray. In a food processor, grind the oatmeal and wheat germ if using, until fine. In a bowl sift together oatmeal mixture, flour, sugar, baking powder, baking soda, and salt. In a large bowl, beat the eggs, peanut butter, molasses and water. Add flour mixture and mix just until ingredients are combined. If mixture is too dry, add an additional teaspoon or two of water. Stir in chips. Great photo of mom! Love biscotti with coffee or tea. Oooooh - peanut butter biscotti, what a fantastic idea!! This biscotti looks so good! How did you get it that perfect looking?